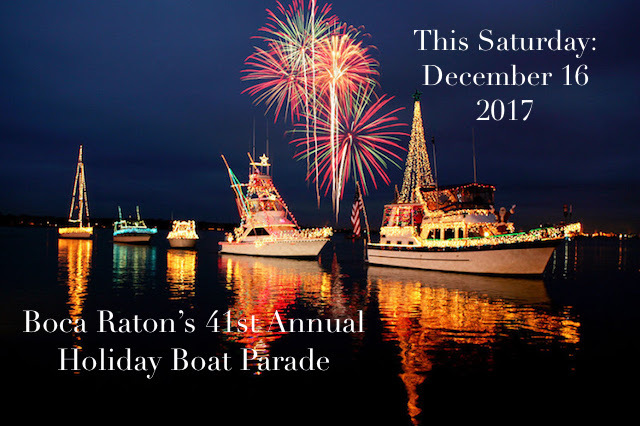 Boca Raton's 41st Annual Holiday Boat Parade: Come out and join in on the fun! On Saturday, December 16, 2017, the city of Boca Raton will hosts the 41st Annual Holiday Boat Parade. This highly-anticipated yearly event is the perfect way to experience the holiday season in South Florida! Last year over 20 boats participated in the parade, and this year’s parade is sure to be just as exciting! This year’s theme is “Light Up Boca! !”, and will be taking place from 6:30-8:00 pm. The parade route runs along the Intracoastal Waterway, beginning at the Boca Raton-Delray Beach city limits traveling South to the Hillsboro Bridge. Entry in the boat parade is FREE, from man-powered vessels to jumbo yachts, vessels of all sizes are welcome. There will also be thousands of dollars in cash prizes and awards, offering boat enthusiasts all the more reason to participate in this spectacular event. Parade entries are scored by lights, holiday decor, theme, and overall appearance, and with this year's amazing prizes you can be sure to count on an impressive display. If you would rather sit back and watch the show, come enjoy the parade from Red Reef Park (West), the Wild Flower Property, or Silver Palm Park viewing areas. The city of Boca Raton will be collecting donations for “Toys for Tots” at all three locations, and NEW THIS YEAR, each of the viewing areas will feature food and drink vendors and dessert trucks, so be sure to bring a new toy to donate as well as your appetite! Plan an evening with friends and family and get into the holiday spirit South Florida-style at Boca Raton’s 41st Annual Holiday Boat Parade! For additional information regarding parade entry, bridge closures, viewing areas, and parking information click here to visit the City of Boca Raton's Special Events site or call (561) 393-7795.